Musa Echweru attracted the wrath of legislators who accused him of having no tangible action plan to avert the widespread disasters. Photo by Vincent Kasozi. KAMPALA–MPs have trashed a report by the State minister for Disaster Preparedness, Musa Echweru, on the natural disasters currently ravaging the country. Several natural calamities have in the recent past claimed lives of Ugandans, with the most recent being a landslide in Bufupa sub-county in Sironko district that claimed one person and left nine missing last month. Ecweru presented a statement on the floor of Parliament this evening on the floods, landslides and windstorm disasters in the country. He attracted the wrath of legislators who accused him of having no tangible action plan to avert the widespread disasters that reoccur periodically. They labelled his statement as empty with the Padyere County MP Joshua Anyawrach branding it a joke. “What is our disaster preparedness and response action plan?” he quizzed the minister while raising a procedural matter. 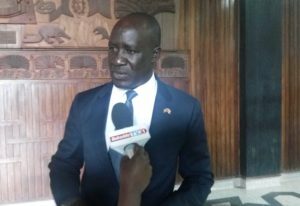 In his statement, the minister observed that eight people died and 10 are feared dead while 40,000 are already affected by flooding and landslides in Bududa, Sironko, Bulambuli, Bundibugyo, Rukungiri, Kisoro and Elegu of Amuru. He also revealed that another 50,000 to 80,000 people will be affected by floods in Teso sub-region and the districts of Butaleja and Ntoroko. According to the ministers statement, 50 metric tons representing 500 bags of maize flour, have been delivered to Sironko district while Bududa district has received 30 metric tons (300 bags) as relief food. The Obongi county MP Kaps Fungaroo sarcastically asked the minister whether his ministry should not be named a ministry for food since he was always requesting for food aid instead of averting disasters. “Your ministry is called disaster preparedness. I have looked through your report and didn’t see any component of preparedness,” he said.